Leveraging cloud computing to lower costs and increase business agility can create undeniable benefits for organizations of all sizes. In particular, small- to medium-sized businesses (SMBs) and distributed enterprises have much to gain by going to the cloud as they can dramatically increase storage flexibility without major investments in hardware and/or personnel. While the results can be great, transitioning from on-premises hardware and applications to hosted platforms and managed services can be complex and cumbersome, especially because SMBs must navigate all the options and service providers now surfacing across public, private and hybrid cloud environments. With each cloud type, there are many issues to consider, including understanding where and how business-critical data is stored, secured and safeguarded. Now more than ever, SMBs are poised to move data to the cloud, so they need rock-solid assurances that their data will remain safe and sound. 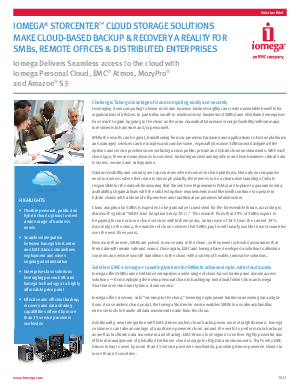 Once again, EMC and Iomega have developed a solution to alleviate concerns and ensure smooth transitions to the cloud with a variety of flexible, innovative solutions.